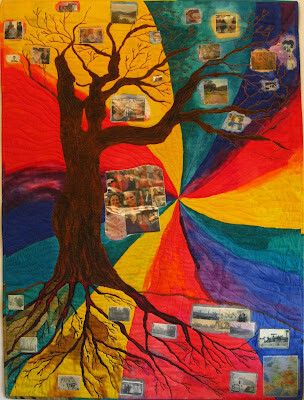 In 2002, I applied for a grant to create a series of quilts about the stories of my ancestors. My Dad, Robert Eischen, was a story teller, and his tales of growing up from a by-gone time fascinated me. This is one quilt of three that I created for that series. 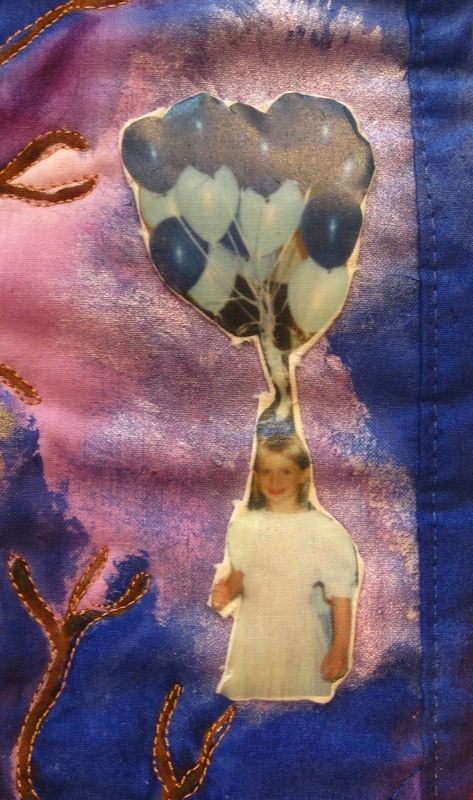 I was learning a new technique of photo transfer to fabric to capture the visual capability of film on fabric. 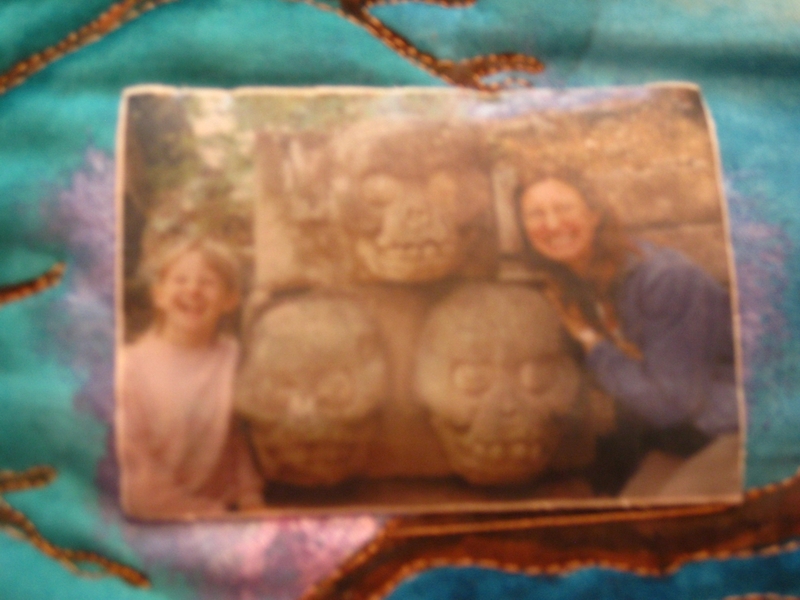 Since the creation of these quilts, I’ve experimented and learned a lot about photo transfer. 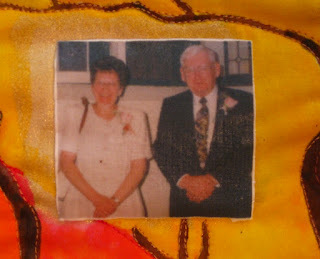 Bringing these art quilts out fill me with memories and good feelings. Here’s a little about the process of creating. 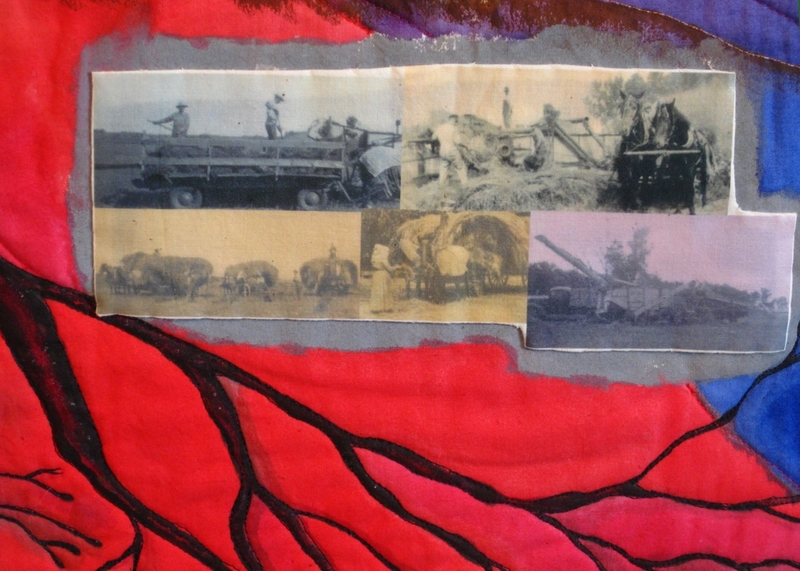 The art quilt measures 52.5” x 60.5”. First a huge tree was sketched on the cotton. Fabric paint was mixed and painted on the cloth. When the painting was dry, the art quilt was sandwiched with the batting and the backing fabric and pinned together. The machine quilting was accomplished with a Bernina home sewing machine with free motion quilting. 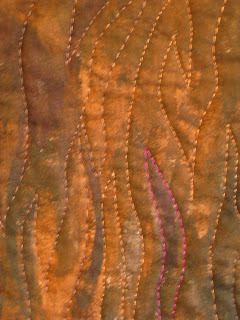 Free motion refers to the quiltmaker moving the fabric to create the lines of stitching. 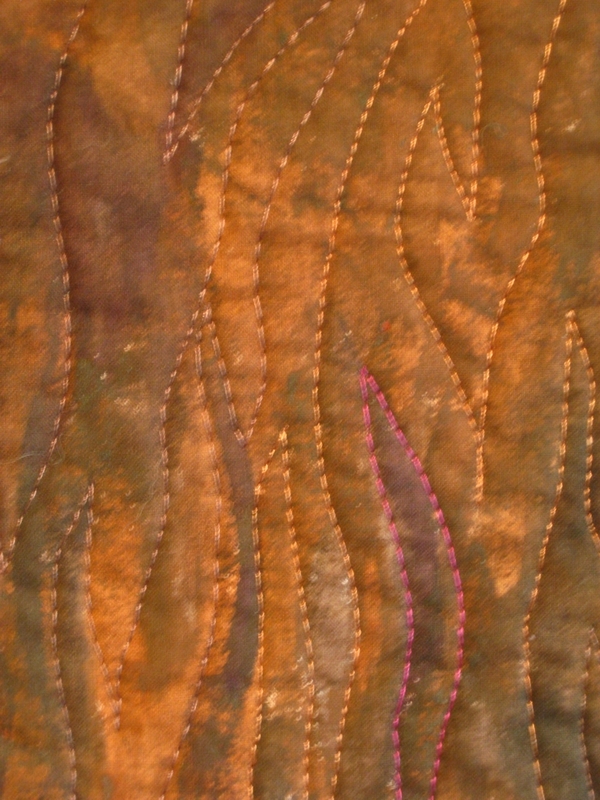 The stitching in the quilting is a design element similar to the finishing lines in a painting. Four generations, my Grandmother in the center, Mary Catherine Windschitl, my mother to her right, Mary Rose Eischen, my daughter on my lap, Amaliya Rose Eischen, and quilt maker, Mary Lee Eischen. Photos in the roots are the homes, gardens and barns of my grandparents and parents. 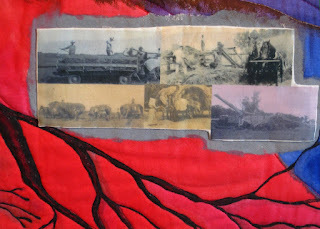 The collage of images depicting haying is my mother’s family. The map shows the lands of my ancestors: Austria, Czech Republic, Germany, Luxembourg, and Ireland. Photos in the branches are more contemporary. 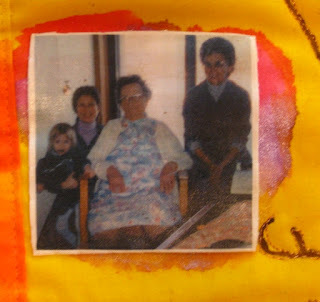 The little boy is my father and there is a photo of my mother and father laughing together in the upper left as you look at the quilt. 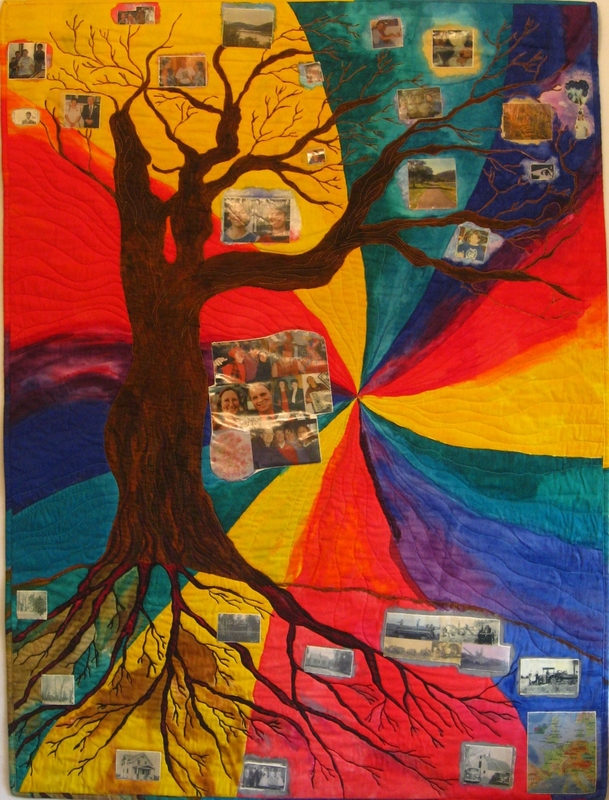 Many friends are represented whom I feel such strong bonds as close as family: Mary Boutain, Colleen Haas, Jenny Marquess, Kim Hammer, Elle Newman, Inge Chapin, Lyn Horness, Karen Smaby, Brett Helsa, David Syring, and Mitra Emad are some of the friends who are pictured on the quilt. The little girl pictured with balloons on her head in one picture and making a face like a Mayan statue at Chitchen Itza in Yucatan, Mexico in another picture is Amaliya, our daughter. And the man smiling with me is Bob Stuber, my dear husband on our wedding day. Our black and white very talkative cat, Oreo, is part of our family too.